One of China’s “four treasures of the Republic” will be offered by Cherrystone Philatelic Auctioneers of New York City on 12th and 13th June. 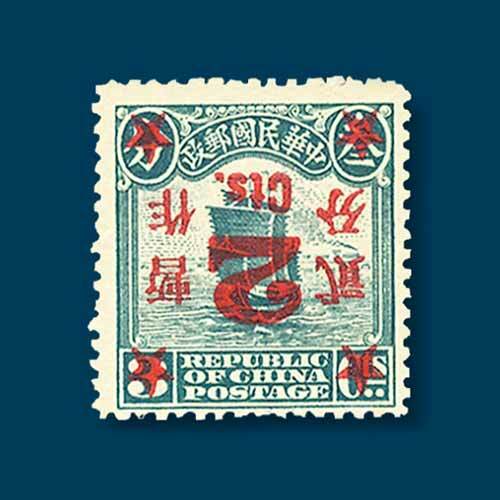 The 2¢-on-3¢ blue-green Junk stamp was issued in 1922 with an inverted red surcharge. Less than 20 examples of this stamp survive today. The offered stamp is well-centered and features deep bright colour. It has original customary flat and dried gum. The never hinged stamp also comes with a 2009 Pascal Scheller certificate. A 4¢ deep red-brown and black Pan-American Exposition stamp issued in 1901 will also be offered. The center is inverted and is without the “Specimen” handstamp. A $1 Rush Lamp and Candle Holder stamp issued in 1979 with the intaglio brown inverted is another major highlight. This one is commonly known as the “CIA” invert. A margin block of four 29¢ Stock Exchange Bicentennial issues with black inverted issued in 1992 is also offered. This item has extra inverted vignettes in the margin. Guatemala and Mexico Civil War issues from the Robert T. Lee collection will also be offered at the auctions.